Happening this weekend: a used-clothes fashion fundraiser that will help with relief efforts. (SPOT.ph) "What on earth will a calamity victim do with a leather jacket?" It may seem like a ridiculous question, but it's something that volunteers of the Philippine Red Cross have asked themselves many times. The Philippine Red Cross directs and coordinates the giving of aid to victims of calamity in the form of rescue operations and medical assistance. They also receive food and clothing donations. This year alone, they received about two tons of clothing donations. Herein lies the dilemma: among those clothing donations are items that may not be appropriate for everyday wear of calamity victims. We're talking designer tops, cocktail dresses, and coats. Deemed unsuitable for distribution, something had to be done with these garments. 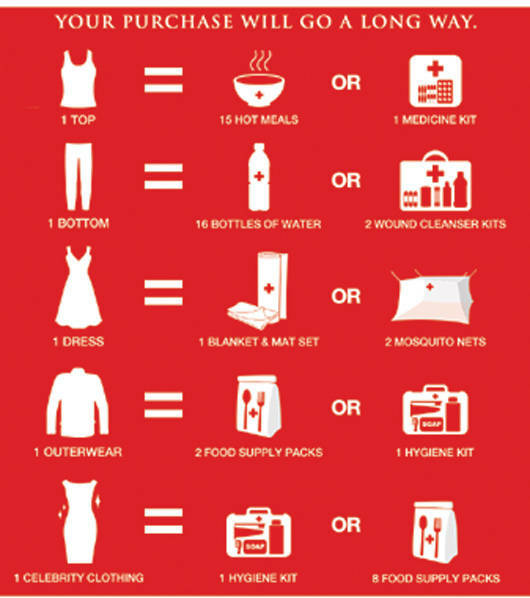 And so, the Philippine Red Cross came up with Aid Couture, a unique used-clothes fashion fundraiser. Aid Couture enlists the support of Ariel and Downy to launder, dry-clean, and give new life to these pre-loved items. Then, with the help of fashion designer Happy Andrada, model Vicky Herrera, and celebrity stylists Paulo Castro and Jujiin Samonte, the clothes are then sorted, styled, and sold to the public. Proceeds of the sale go to the purchase of more medical supplies, search-and-rescue equipment, hot meals, and clean water-all for future relief efforts. 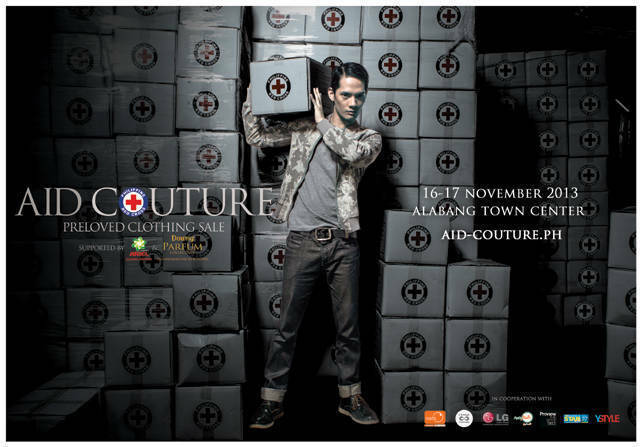 Aid Couture is the first fashion fundraiser of its kind, so be part of history and join us on November 16 to 17, 2013 at Alabang Town Center, from 10 a.m. to 10 p.m. Every garment also includes a price tag that shows the equivalent life essential you'll be providing the Philippine Red Cross. So while a victim may not have much use for a leather jacket, he most certainly would appreciate the clean, potable water and hot meals it could give him and his family. For questions, please contact Keena Piedad at 0917 -887-3929 or 884- 8001 loc 331. Aid Couture is supported by Ariel and Downy. The event is also made possible with LG Commercial Washers and Dryers, Suds Laundromat, Ayala Malls, Preview The Style Bible, and Change Clothes Philippines.